"Sampath Speaking" - the thoughts of an Insurer from Thiruvallikkeni: Sri Lanka injuries at Canberra .. .. .. and at WC 1975 ! Sri Lanka injuries at Canberra .. .. .. and at WC 1975 ! It was 1975 – Prudential world Cup – the first ever limited Over tournament for men.. Sri Lanka and East Africa were the new entrants. Tamil cricket fans know almost all Lankan players well, with frequent matches of MJ Gopalan trophy but Lankans were new to International arena. In the first match they were shot out by WI pacers and had a nine-wicket drubbing. Next was the game against Australians. Put into bat, Australians piled on 328 for 5. In reply, Sri Lanka had a flying start, reached 150 for 2 in the 32nd over. They could survive the opening fire of Jeff Thomson and Dennis Lillee but – the second spell was of a different game plan. The score card would read : Australia 328/5 in 60 overs – Rick McCosker 73 & Alan Turner 101. Somasundara de Silva 60/2 in 12 overs. Sri Lanka a healthy 276/4 – MH Tissera 52 & Wettimuny 53*; Ian Chappel 2/14 and Jeff Thomson 1/22 .. do you remember the original tale that unfolded on that day ? The president of the Green Island Cricket Club says he's "heartbroken" to confirm the death of one of its players during a match in Dunedin, New Zealand. Hareesh Gangadharan, a member of the Second Grade team, was playing at the club's Sunnyvale Sports Centre ground against an Albion side and died after suffering a medical event on Saturday.It is understood that he was walking away having completed bowling an over when he collapsed, about 4pm. The family man had played for the club for five or six seasons.Some members of the team had medical backgrounds and a defibrillator kept in the club house was used, but Gangadharan could not be revived. Gangadharan was understood to be 33 and married with a young child, Otago Cricket Operations manager Tim O'Sullivan said. He played in a team made up predominantly of Indian players. At Canberra Australia 5 for 534 dec (Burns 180, Travis Head 161, Patterson 114*) and 3 for 196 dec (Khawaja 101*, Head 59*) beat Sri Lanka 215 (Karunaratne 59, Starc 5-54) and 149 (Starc 5-46) by 366 runs. A rampant Mitchell Starc devastated the Sri Lanka top order, sending the visitors hurtling to a fourth-day 366-run defeat at Canberra. Sri Lanka failed to reach a total of 200 for the third time in four innings in Australia; and none of their batsmen were able to cross fifty. They have now been winless since late October, and have lost six of the last seven Tests they have played. For Starc, this Test has been an emphatic return to form, after a tough home summer. He sealed the victory with his tenth wicket in the match - the second time he has achieved a 10-for, the other occasion also having been against Sri Lanka. Starc was not quite as quick on day four as he had been in the first innings, but having already roughed up a number of Sri Lanka batsmen in this Test, he was no less fearsome. Lankans would like to forget this test not only for the result – more for the injuries. 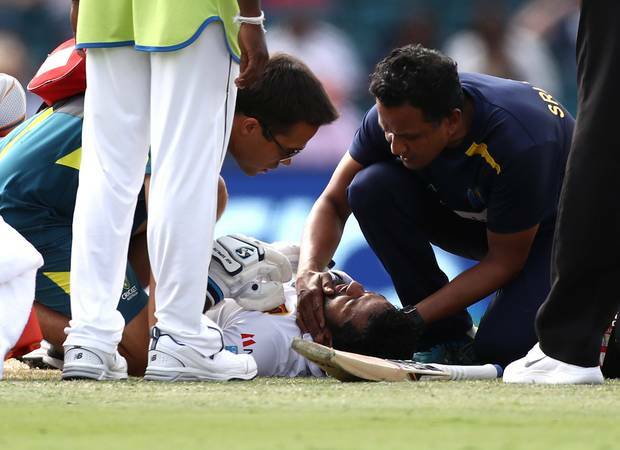 Kusal Perera had to leave the field on Sunday after he was hit on the helmet, the second Sri Lankan player in two days to leave with a head injury. Perera was to undergo a mandatory concussion test after he was unable to continue batting at Canberra's Manuka Oval in the first session of the third day. 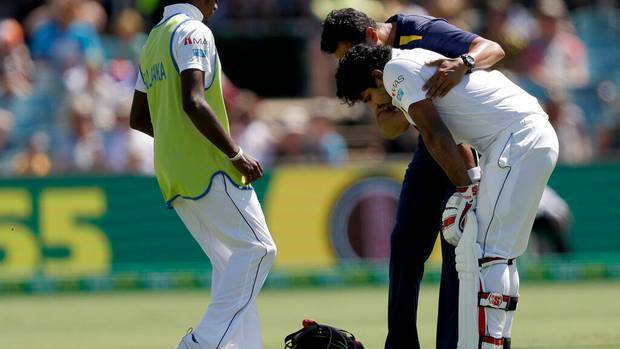 Perera was replaced by Dimuth Karunaratne, who had retired hurt on day two after being hit in the neck by a bouncer. Good that Karunaratne was cleared to return to the crease, less than 24 hours after being felled by a Pat Cummins delivery.Play was stopped for almost 15 minutes on Saturday as Karunaratne was treated on the field before he was put on a stretcher and taken from the field to Canberra Hospital by ambulance. In 1976, India toured West Indies under Bishan Singh Bedi. WI won the first test at Bridgetown, by an innings and 97 runs. The second one at Port of Spain was drawn and the third one on Apr 1976 was historic. Indians chased 405 in the fourth innings and won by 6 wickets with Sunil Gavaskar and Vishwanath making centuries, ably supported by Mohinder Amarnath, Brijesh Patel and Madanlal. In that background, the Fourth Test at Kingston – Test no. 776 in Apr 1976 had to be different. The score card read : India 306/6 decl !! ; WI 391 all out. India 97 all out and West Indies making the 13 runs required without losing a wicket. Statistics will never reveal the real story.WW Daniel made his debut in a bloody test, where Indians were intimidated with crowds calling for blood. No doubt the WI had class quickies but the strategy was questionable and many batsmen suffered nasty injuries trying to take evasive action. The short pitched bowling was over done and Holding from round the wickets caused most damage to the bodies of Indians. The result could not have been dreamt of from the first day. At stumps on bad light curtailed day one Indians were 178/1; Gavaskar bowled Holding for 66; Anshuman Gaekwad 58* and Mohinder 25* firm at the crease. Gaekwad’s innings was one of raw courage taking several blows on the body and arms – the gears were not so protective those days. With the score at 237 Gaekwad was forced to retire bleeding in his ears. At 273 Brijesh Patel retired hit on the mouth. At 306 Venkatraghavan got out. Bedi wished to protect himself and Chandrasekhar from injuries and hence declared at 306/6. In that test one player after other had to be escorted to hospital with bleeding injuries. In the Second essay, Gavaskar failed to Holding and half of the team was not fit to play. Mohinder made a gutsy 60. Only Gavaskar, Vengsarkar, Mohinder, Madanlal, Kirmani and Venkat padded up. Gaekwad was not in a position to play – so also were Gundappa Vishwanath and Brijesh Patel. Bedi & Chandra did not bat for the second time and with 5 batsmen absent hurt – it was recorded that Indians were all out for 97. Returning back to that World Cup match of 1975 – Australia fearing the threat – started firing the bodies. Sunil Wettimuny would certainly love forgetting that fear created by Jeff Thomson, arguably the fastest bowler to draw breath. "We had never seen such pace and with the way Thommo seemed to hide the ball behind his back, you couldn't pick it at all," Wettimuny would recall decades later. In his opening spell Thomson hit Wettimuny twice in the inner thigh, and also delivered a cracking blow to the hip bone and a crunching hit to the ribcage. Mendis played a couple of Thommo's deliveries, after which the fast man let fly. One flyer hit him squarely on the forehead. He staggered and fell heavily to the crease and had to be carried off the ground on a stretcher. Thommo was booed by the crowd as the Sri Lankan captain, Anura Tennekoon, slowly ambled to the crease. In one instance after hitting Wettimuny and with bastman hopping about in pain, Thommo tried to run him out too. .. .. .. .. there have been many injuries on the field and some imposed with fear !